On March 21, 1942, Roosevelt signed Public Law 503 (approved after only an hour of discussion in the Senate and thirty minutes in the House) in order to provide for the enforcement of his executive order. Authored by War Department official Karl Bendetsen—who would later be promoted to Director of the Wartime Civilian Control Administration and oversee the incarceration of Japanese Americans—the law made violations of military orders a misdemeanor punishable by up to $5,000 in fines and one year in prison. As a result, approximately 112,000 men, women, and children of Japanese ancestry were evicted from the West Coast of the United States and held in American concentration camps and other confinement sites across the country. Japanese Americans in Hawaii were not incarcerated in the same way, despite the attack on Pearl Harbor. Although the Japanese American population in Hawaii was nearly 40% of the population of Hawaii itself, only a few thousand people were detained there, supporting the eventual finding that their mass removal on the West Coast was motivated by reasons other than "military necessity." Japanese Americans and other Asians in the U.S. had suffered for decades from prejudice and racially-motivated fear. Laws preventing Asian Americans from owning land, voting, testifying against whites in court, and other racially discriminatory laws existed long before World War II. Additionally, the FBI, Office of Naval Intelligence and Military Intelligence Division had been conducting surveillance on Japanese American communities in Hawaii and the U.S. mainland from the early 1930s. In early 1941, President Roosevelt secretly commissioned a study to assess the possibility that Japanese Americans would pose a threat to U.S. security. The report, submitted exactly one month before Pearl Harbor was bombed, found that, "There will be no armed uprising of Japanese" in the United States. "For the most part," the Munson Report said, "the local Japanese are loyal to the United States or, at worst, hope that by remaining quiet they can avoid concentration camps or irresponsible mobs." A second investigation started in 1940, written by Naval Intelligence officer Kenneth Ringle and submitted in January 1942, likewise found no evidence of fifth column activity and urged against mass incarceration. Both were ignored. Over two-thirds of the people of Japanese ethnicity were incarcerated—almost 70,000—were American citizens. Many of the rest had lived in the country between 20 and 40 years. Most Japanese Americans, particularly the first generation born in the United States (the Nisei), considered themselves loyal to the United States of America. No Japanese American citizen or Japanese national residing in the United States was ever found guilty of sabotage or espionage. Americans of Italian and German ancestry were also targeted by these restrictions, including internment. 11,000 people of German ancestry were interned, as were 3,000 people of Italian ancestry, along with some Jewish refugees. The interned Jewish refugees came from Germany, as the U.S. government did not differentiate between ethnic Jews and ethnic Germans (the term "Jewish" was defined as a religious practice, not an ethnicity). Some of the internees of European descent were interned only briefly, while others were held for several years beyond the end of the war. Like the Japanese American incarcerees, these smaller groups had American-born citizens in their numbers, especially among the children. A few members of ethnicities of other Axis countries were interned, but exact numbers are unknown. There were 10 of these concentration camps across the country called “relocation centers”. There were two in Arkansas, two in California, one in Idaho, one in Utah, one in Wyoming, and one in Colorado. In December 1944, President Roosevelt suspended Executive Order 9066. Incarcerees were released, often to resettlement facilities and temporary housing, and the camps were shut down by 1946. On February 19, 1976, U.S. President Gerald Ford signed a proclamation formally terminating Executive Order 9066 and apologizing for the internment, stated: "We now know what we should have known then—not only was that evacuation wrong but Japanese-Americans were and are loyal Americans. On the battlefield and at home the names of Japanese-Americans have been and continue to be written in history for the sacrifices and the contributions they have made to the well-being and to the security of this, our common Nation." In 1980, U. S. President Jimmy Carter signed legislation to create the Commission on Wartime Relocation and Internment of Civilians (CWRIC). The CWRIC was appointed to conduct an official governmental study of Executive Order 9066, related wartime orders, and their impact on Japanese Americans in the West and Alaska Natives in the Pribilof Islands. In December 1982, the CWRIC issued its findings in Personal Justice Denied, concluding that the incarceration of Japanese Americans had not been justified by military necessity. The report determined that the decision to incarcerate was based on "race prejudice, war hysteria, and a failure of political leadership". The Commission recommended legislative remedies consisting of an official Government apology and redress payments of $20,000 to each of the survivors; a public education fund was set up to help ensure that this would not happen again (Pub.L. 100–383). On August 10, 1988, the Civil Liberties Act of 1988, based on the CWRIC recommendations, was signed into law by Ronald Reagan. On November 21, 1989, George H. W. Bush signed an appropriation bill authorizing payments to be paid out between 1990 and 1998. In 1990, surviving internees began to receive individual redress payments and a letter of apology. This bill applied to the Japanese Americans and to members of the Aleut people inhabiting the strategic Aleutian islands in Alaska who were also relocated. The anniversary of the signing of Executive Order 9066 is now the Day of Remembrance, an annual commemoration of the unjust incarceration of the Japanese American community. ^ a b Roosevelt, Franklin (February 19, 1942). "Executive Order 9066". U.S. National Archives & Records Administration. Retrieved April 25, 2014. ^ a b c d e f "Relocation and Incarceration of Japanese Americans During World War II". 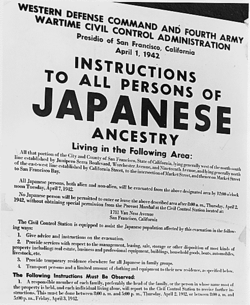 University of California – Japanese American Relocation Digital Archives. Retrieved April 25, 2014. ^ Kashima, Tetsuden. "Custodial detention / A-B-C list". Densho Encyclopedia. Retrieved August 20, 2014. ^ Niiya, Brian. "Kenneth Ringle". Densho Encyclopedia. Retrieved August 20, 2014. ^ "Japanese Relocation During World War II". National Archives. August 15, 2016. Retrieved March 1, 2019. ^ "President Gerald R. Ford's Remarks Upon Signing a Proclamation Concerning Japanese-American Internment During World War II". Ford Library Museum. Retrieved January 30, 2017. ^ US Government (August 10, 1988). "Public Law 100-383 – The Civil Liberties Act of 1988". Topaz Japanese-American Relocation Center Digital Collection. Retrieved April 25, 2014. ^ "Day of Remembrance for Japanese-Americans Interned During WWII". Long Beach Post. 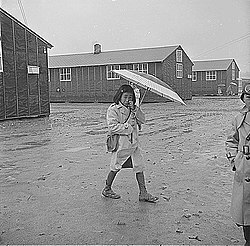 Wikimedia Commons has media related to Japanese American internment.